I wanted to take a minute to write about my dear little foster pug, Eloise. She has become so much a part of our family that I sometimes forget she is a foster. Eloise came to PugHearts mid-May after being found in another pug owner's back yard. My husband and I were between fosters at the time, but were the ones to pick her up and name her. It became apparent very quickly that this little girl had been part of a home and was a pampered pet at some point in her life. She has not had one single accident in the 7 months we have had her and she is very aware of other house etiquette as well as how to demand to be spoiled. Sadly, after her first visit to the vet, she was diagnosed with kidney failure. Her prognosis is uncertain. It could have been only a month or two, or she could live several more years. So far, she seems happy. I don't think she is always comfortable and perhaps sometimes in pain, but she still enjoys all the little things in life; Food, treats, warm/comfy places to sleep, and toys. She goes absolutely nuts for her mini tennis balls. It is such a great feeling to provide this little girl a warm and loving home, even if she possibly won't be with us much longer. I mean, how can you resist this face? 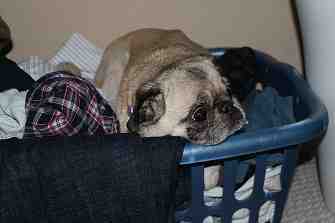 PugHearts has successfully placed over 400 pugs into loving and caring forever homes. Some of these adoptive families keep in touch. We love to get updates and photos of our fosters after they have found the permanent love and life that they have been looking for. This is one of the things that makes fostering easier. The happiness, love and pure joy of both the foster pug and the members of the adoptive family. We added another success story to our files yesterday. Noel and Eric were adopted into a forever home together. This is even better than normal, as they had been foster brothers together as well. They will now be brothers forever. Congratulations boys! Congratulations also to the foster family. These were their very first fosters and they did a great job. The boys were adopted near the home of 2 of my personal favorite fosters. Now, this does not mean that I do not love all of the fosters that have come through my home. There are just certain ones that really get in into your heart and take a piece of it with them forever. So, I called the adoptive family for Nicholas and Torrey last night to see if they might be home. THEY WERE! and they were gracious enough to tell me to come on over. Needless to say....I did. Special thanks to Nick and Torrey's family for allowing me this pleasure. I was like a kid at Christmas getting to see them. For those who may be new with us. These fosters were really special. Nicholas came to us the day after Christmas 2008. He had sarcoptic mange, severe heartworms, his eyes were crusted over from gunk and infection and his skin was infected from scratching and living on the streets. I thought he was beautiful from the first moment. He had the most serene and happy demeanor. Nicholas loved everyone. He spent over 8 months with me getting well, strong and ready to go to his forever home. I cried all the way to their house and all the way back home. It was a perfect place for him and I am so glad they love him like I do. He looks beautiful now, just as I pictured he would all that time ago. This is Nicholas as he looked in my home just before he was adopted. Torrey has an equally sad story to her time with us. Torrey was living in a neighborhood getting by as best she could. The people knew she was there, but no one did anything to get her to safety. Torrey was scared of everyone and everything. Alica and Dack went to the neighborhood when we were notified about her being there. They had to chase her for a long time. She was finally cornered in a person's garage and caught. Torrey promptly bite Dack when he grabbed her and then totally relaxed in his arms as if to ask him: "What took you so long to come?" That is Torrey...a true character. She took some time to learn to trust, but found my husband an easy touch for treats and adopted him. Torrey had been chronically dehydrated from living as a stray and her kidney values were outside of normal. We worked with her for some time before we spayed her, as we were concerned about what would happen if she was sent to surgery. Torrey was placed on a special kidney diet and I am happy to report that her kidney values are now coming in to the normal ranges. Torrey is now busy running her home and making sure all the people (and Nicholas) are doing things the right way. This is Torrey as she was during foster care. So, why do I tell you all this story? Well...first it is a request for updates and pictures of the successes. We love to hear from our babies after they are adopted and settled into their forever homes. Second...I love for everyone to see the results of all the hard work, tears, money and time that go into the daily operations of PugHearts. We have to make some tough decisions for these needy babies. Some of these decisions are good and some are terribly hard. We do not always win for them. PugHearts has lost the battle for several of our fosters recently. The losses were hard and they hurt. Briscoe, Captain, Ivey, Ashley and Allison are missed. I wanted some good news. We are so grateful that there are so many people and families out there that love these babies as much as we do. 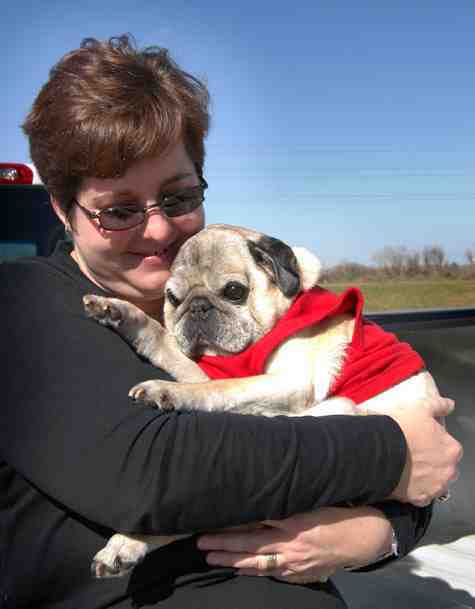 Thank you to all of the families that have adopted and love our PugHearts fosters. You make this work worthwhile. Remember we are always in need of donations, adoptions, and support to make the fairy tale possible for the next pug that needs us. What a Week It Has Been!!!!! I sat down tonight and thought about what I wanted everyone to know about this last week. This week has been a roller coaster ride. I started the week feeling really down and frustrated. This is not an uncommon feeling in rescue, but one that we often do not like to talk about. I was thinking about the fact that we had 96 pugs in foster care. 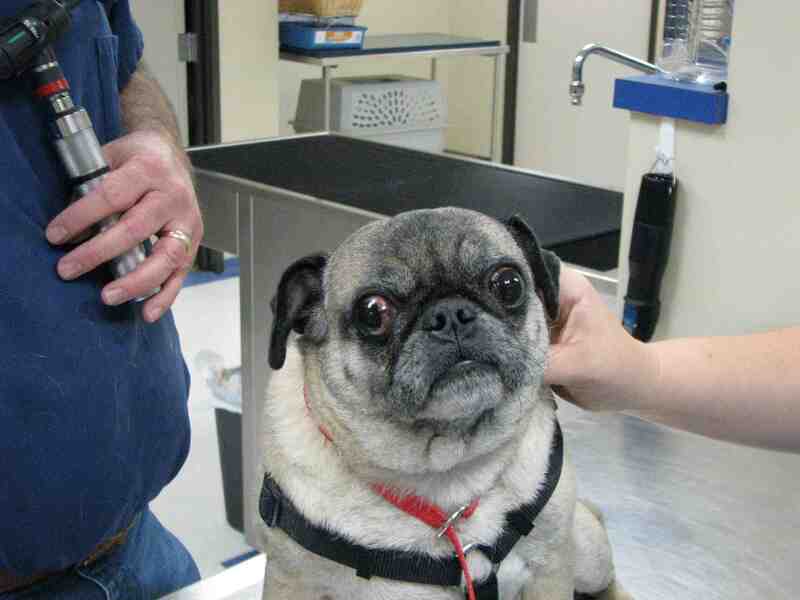 We had a $22,000+ vet bill and several pugs boarding at the vet waiting for a place to learn to be a pet again. I spent a fair amount of time sitting in the floor with the pugs in my house. I needed something to make me believe again, in rescue and in myself. Wow...did I ever get that. On Tuesday, I received a call from a local vet's office. A puppy mill owner was closing out and I was told he had 12-15 pus that needed to come into rescue. This was NOT good news considering the number of pugs already in our care. I was not sure we could even make this happen. 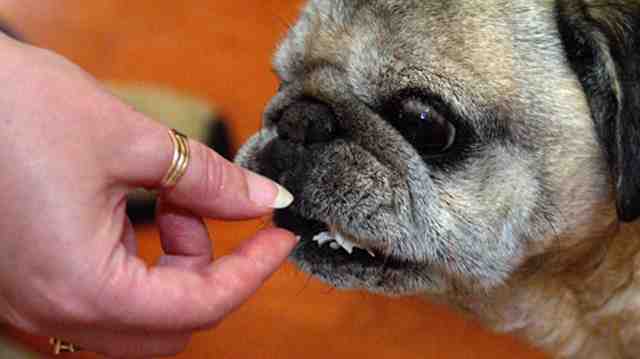 PugHearts prides itself on the ability and willingness to take any pug, at any age, in any condition. I did not think we could do that in this situation. I started with an email to the board and then to our list of supporters. I called San Antonio pug rescue and Pug Rescue Austin. The response was overwhelming. You are all incredible. The response was immediate and beyond anything I could have dreamed. Offers to foster have been coming in, transportation help and support for what we do have poured in. The monetary donations have allowed us to pay down our vet bills. 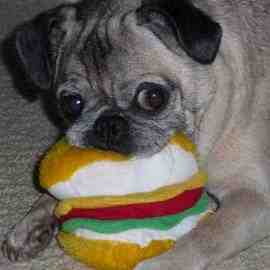 The puppy mill did surrender thier pugs and tell us that they are no longer breeding pugs. Sadly, he stated he is moving on to Bulldogs. I will fight this as hard as I can. No breed should have to deal with the life of a breeder's commodity. They should be warm, loved, in a house and part of a family. I will do all I can to fight him on this point. There were 11 pugs totoal. 9 females and 2 males. San Antonio pug rescue took in 9 of the puppy mill pugs. They had 17 pugs in their care prior and has the space to care for that many. 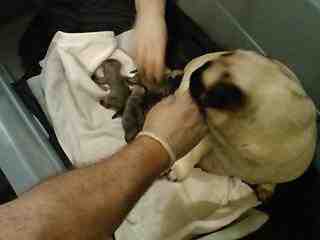 They are getting the pugs in their care into their vet tomorrow. We are very greatful for their assistance and know that the pugs are in good hands. 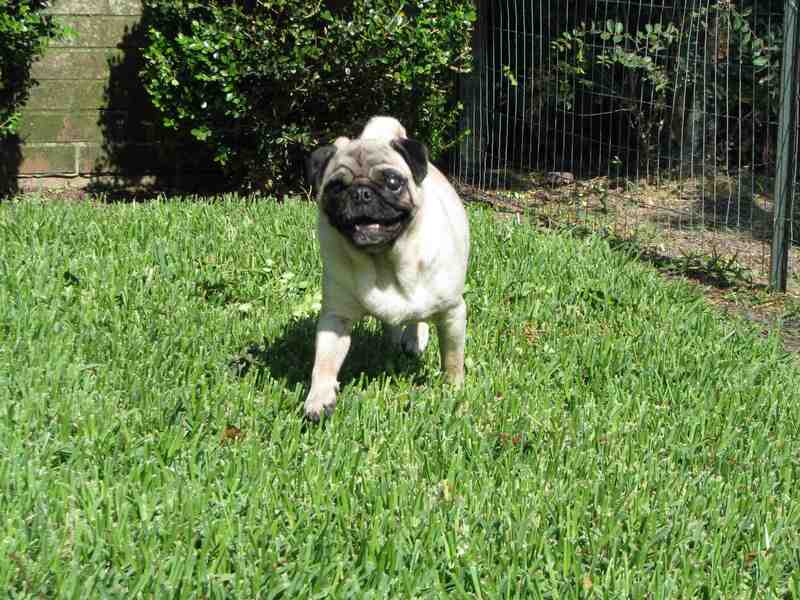 Pug Rescue Austin is working to find foster homes for a few of the ones that San Antonio took. PugHearts took in 2 pugs; a male and a female. The male is a 4 year old that has spent his life in a kennel helping to produce puppies. We have named him Deisel. The female is 5 years old. Her feet are spread from standing on wire crates without towels, paper or solid foundation. She has multiple cysts between her toes. The sadest part is that she is showing signs of either a neurological or psychological issue. She makes odd movements with her head and circles, almost continuously, in her crate. We named her Diamond. PugHearts will do all than we can for both of these babies. They will get all of the medical care they need and we will find fosters that will allow them to learn to be pets and give and accept love. We thank you all for your support. We are successful because of each and every one of you that support PugHearts in the work that we do. I am honored to be allowed to be a part of this group. I have sat down to write this entry several times now. February 14th was our 3 year mark. That's right, PugHearts is 3 years old. It does not seem possible that we have been doing this for 3 years already. I can still plainly remember the day that Richard and I met, so that I could see Alfie. It was a beautiful January day. Alfie looked so happy and loved. I wanted that for all of the pugs that wander looking for love and care. I starting thinking and asking questions. My husband would tell you that is a dangerous time. PugHearts was born on that day. We officially started on Valentine's Day 2007 (What a better start date for PugHearts, right?) and off we went. On the date of our birthday, we have rescued a total of 516 pugs (with a few imposters in the mix). We currently have 96 pugs in our care looking for new homes. That is the hard part. The numbers keep going up and the medical issues of those we are helping are getting more severe and costly. One of the things we are most proud of is that we will take any pug, regardless of their condition. I do not want to change that, but there are times it is hard. The money has to come to pay the bills, the adoption have to happen to allow space for the next needy pug. This is where the public and our wonderful volunteer group becomes so critical. There is always a need for transports from shelters to the vet, foster homes so that the pugs can heal, learn and become ready for their new lives, people to promote us and talk to their friends and families about rescue and why it is so important and above all else...there is a need for people to adopt and love our fosters for the rest of their lives. This is the ultimate goal. Lexi is a senior that is looking for someone to love her and play with her for her golden years. Lexi came to us with a ruptured kidney that had to be removed. She acts like a young dog now. Allie is blind and needs someone to help show her the way. She is a lover and a cuddler that will totally trust you once you form that bond with her. Addison came to us VERY pregnant and delivered within the week. She is a sweet girl that craves love and attention from her people. She is being a good Mom, but will be very happy when it is time to be a pet. Yoda is a diabetic that takes 4 units of insulin twice a day. He is a great guy and takes his medicine well. Eric is a young male that came to us skinny and full of parasites. He is learning to be a good boy and is preparing to make a family very happy. Why do I show you these pugs? Because I want you to understand that we rescue all ages and all sorts of medical needs. We have youngsters, seniors and everything in the middle. If you are looking for a great match for you and your family...we probably have it. So please...spread the word, donate your time and/or money, foster a pug in need, or provide a forever home to a pug that is looking. We are successful only when we work as a team. You are a part of that team. PugHearts and our fosters need you. Our fundraiser is coming up on Sunday. We are excited and hope to see all of you there. I wanted to take a minute to introduce one of our newer fosters. She came to us in pretty bad shape. We gave her a fancy name to grow into. Tallulah was found in the middle of the road and taken to the local shelter. She was thin, scared and very itchy. Tallulah does not see very well. She is now safe and sound at our vet. She currently has sarcoptic mange and is in isolation for now. Tallulah is about 10. She will go to foster, when she is ready, and will be spoiled and treated as she deserves. This is the reason we are here. The reason our vet bills are as high as they are. We DO NOT turn these types away. We want to make sure they are safe and well cared for. Tallulah will most likely live out her life with us as a permanent foster. The seniors are not adopted as often as the younger, often prettier, pugs. They do not want much. They just want to be loved and to love in return. 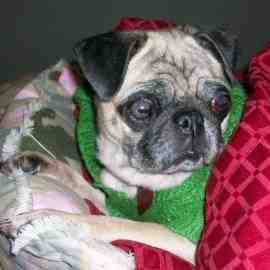 Please consider adopting a senior pug and making their final time as perfect as their lives should have been. If you are not ready to adopt, please consider donating. All of us at PugHearts are starting to get really excited. The big fundraiser is coming soon. 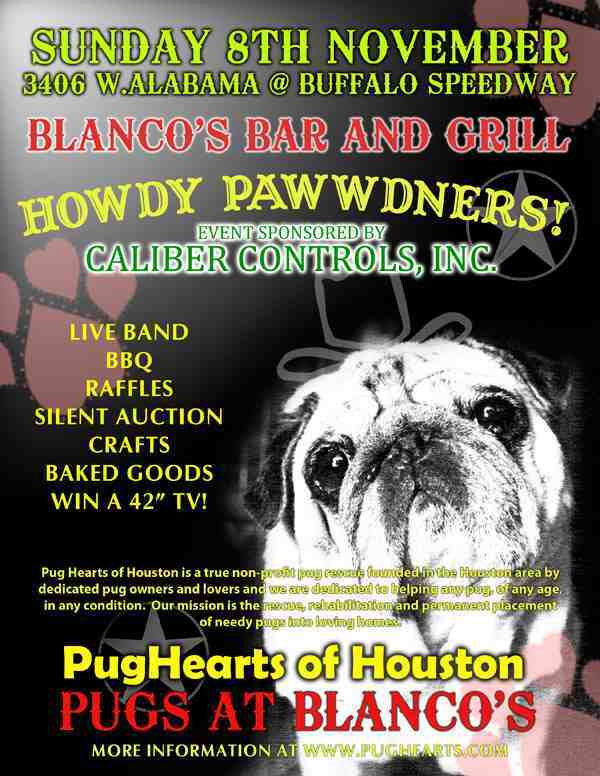 November the 8th PugHearts will be having a great party at Blanco's on West Alabama. We will have delicious BBQ, a live band to keep things moving, silent auctions to satisfy your shopping needs and many, many pugs that need help and homes. Please come out and join us as we eat, visit, have a lot of fun and raise some much needed funds for the pugs. Three years ago today, my heart was being ripped from my chest and I could barely breathe. Today is the 3 year anniversary that Alfie (then Charlie Brown) was adopted by Richard and Robbi. For those of you that know me well, you know this story. I want to tell the story for those of you that are new to PugHearts. I have been thinking about Alfie so much lately. I miss him just as much today as I did the day we lost him. I was privledged to have been allowed to spend the last ferw months of his life with him. I almost missed it and that would have been a shame. He was perfect. Charlie Brown came to me as a foster. He was about 10 and in very poor health. I was not sure he would survive to even be adopted out. He was very thin, scared, did not see well and had the worst breath ever. I thought he was the most beautiful thing I had ever seen. I was in love instantly. Charlie and I had the worst first night EVER. He screamed for 9 hours straight. It did not matter if I held hi or not...if he was crated or not...if he was on the bed or not...or even if he was with the other dogs or not. I sat with him and cried that he was so upset, scared and sad. I sat on the floor of the bathroom and cried with him. Charlie got his name because I kept telling him it was going to be a good life from here on out. Boy, I had no idea how right those words to him would be. I recieved a call that he was to be adopted and the adoption coordinator was coming to pick him up. I told them NO. I wanted to know where he was going and to meet them. I was told no. We had many words regarding this and I refused to let them have Charlie. Finally, I was told that I could go meet the family and finalize the adoption, but I could not contact them again after that day. I agreed and told them they would have to be perfect fo me to leave him there. I am happy to say that they were perect for him. I walked out that door crying so hard that I could not see. All I could tell my husband was "just drive". I cried almost non-stop for a week. No one was allowed to say his name or ask about him. I just could not take it. His family named him Alfie. I am happy to say that Ricahard and Robbi had a webcam for the pugs. I became a cyber stalker of Alfie. I would log on and watch him laying there for hours. It really became a bit sick and twisted. I finally called them to ask how he was doing and see if I could just see him. I was not going to foster anymore, as it was too hard. Robbi was so generous and was happy to give me updates and offered to let me see him. I jumped at it. Richard met me in a park with Alfie. Alfie never toushed the ground that day. I was in heaven. This meeting was in January of 2007. 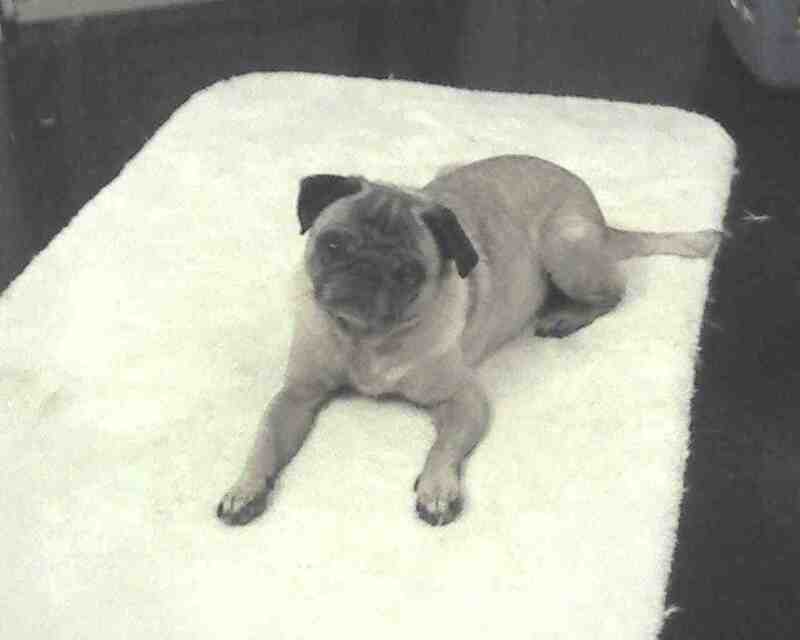 PugHearts was "born" on February 14, 2007 when we went live on the internet. I was honored to have been allowed to spend the last few months of Alfie's life as a part of it. He was loved and adored by his family. They gave him everything that he needed. They made him whole, healthy and (most important) loved beyond words. Thank you both for loving him like he so deserved. I am honored to be the director of PugHearts. I will always remember Alfie and hope he looks down on us and is pelased with his result. PugHearts is his legacy. It was his love that grew to allow us to rescue 446 pugs to date. Thanks Alfie. I love you, always! UPDATE (09/28/09): Lexi is going home to her foster home today. Her white cell count is down and she is feeling great. I wanted to take a minute and introduce you all to Lexi. Lexi is a 10 year old female that came to us last week. Lexi was obviously not feeling well. We were told that she had been having accidents in the house. We had Dr Hendrix do an exam and we found that Lexi had bladder stones. These stones are caused by a high pH in the urine that crystallizes byproducts of the food. Lexi had a large stone. While Lexi was under anesthesia, Dr Hendrix decided to do the spay also. That is a really good thing. The decision saved Lexi's life. Lexi had a VERY infected kidney. The kidney had become so infected that it was adhered to the abdominal wall and the uterus. Dr Hendrix spent a lot of time and showed his skills. He managed to remove the kidney and complete the spay. We were not sure if Lexi would make it through the night. This photo is of Lexi a few hours after surgery. You can imagine that she was very sore. I am happy to report that Lexi was standing in her crate and wagging her tail when the staff come in the next morning. We are all very hopeful that she will do well. Today Lexi has a very elevate white blood cell count. This is not unexpected, as the kidney was so infected. She is on antibiotics and receiving excellent care at Sugarland Pet Hospital. She is a real lover and a happy girl. We are all rooting for her complete recovery.